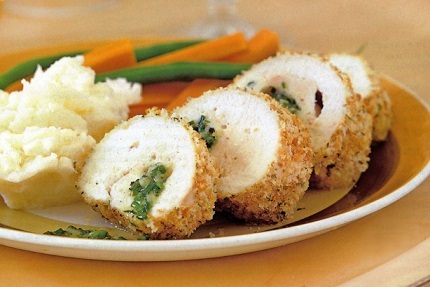 Chicken Kiev, sometimes also called Chicken Supreme, is a rich, classic recipe of boneless chicken breast pounded and rolled around seasoned butter, breaded and fried. It is often served with julienne potatoes and fresh peas. The recipe takes a little time, but when finished you'll have a meal fit for a King (or Queen or Empress). In fact, it was originally created for Ukrainian Empress Petrovna by a French chef named Nicolas François Appert, so the meal really isn't Ukrainian at all. Seems Russian royalty in the mid-late 1700's developed a preference for French cuisine so they were hiring French chefs or sending their chefs to France for training. The name for this chicken dish may have been invented after WW ll by New York City restaurants that served it as a regular menu item because, at the time, there were quite a few Russian immigrants from Kiev living in the city. The recipe became a favorite restaurant recipe. 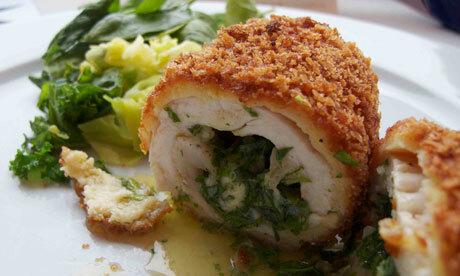 I think Chicken Kiev is a perfect example of French culinary genius - simple but elegant. This is a chicken recipe that makes its own sauce. Slice into the breast and the melted seasoned butter runs onto your plate. YUMMY! Combine butter, lemon juice, minced garlic, tarragon, parsley, salt and pepper in the bowl of a stand mixer or in a food processor. TA-DA! 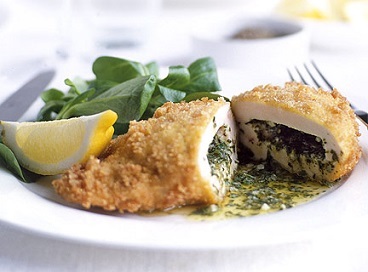 You have just created a Chicken Kiev - a chicken recipe fit for royalty! Serve the chicken with peas and julienne potatoes if you want to be traditional. I often like to serve this chicken with traditional mashed potatoes or twice baked potatoes. Whatever you choose, try to keep the starch and vegetable preparation simple so seasonings do not "fight” with the butter sauce you created for your chicken breasts. 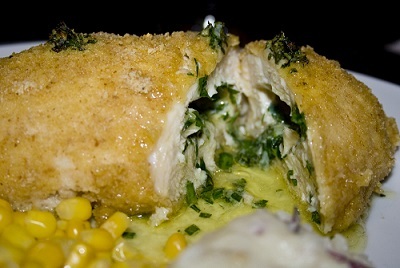 Enjoy your Chicken Kiev and the company of those you share it with!